If you’ve made the decision to start an aquarium, you are in good company. Fishkeeping is fast becoming one of the most popular hobbies in America, and for good reason. 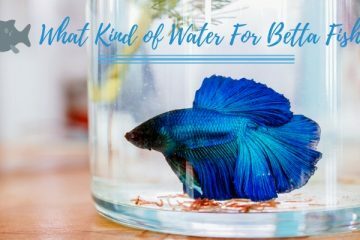 Keeping fish is a great way to entertain yourself, as well as to improve your overall health and wellness. However, once you’ve started an aquarium, you may find that you are overwhelmed by the constant cleaning your tank seems to require. While fish are enjoyable to raise, the upkeep involved in keeping their tanks free of algae can be a daunting task on its own. The takeaway? You need to invest in some algae eaters. Whether you opt for algae-eating fish, snails, or shrimp, algae eaters can take the stress out of fishkeeping in an aquarium – no matter the size or scale. Twig Catfish are not one of the most massive varieties of catfish, but they can grow up to six inches in length. This species has a brown body (yes, like a twig!) that is slim and narrow, with stripes running vertically from the head to tail. 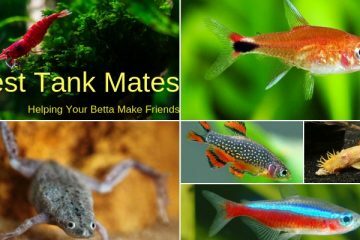 These fish make great tank mates for tetra barbs, other catfish, and many others, largely because they are peaceful and non-confrontational in nature. These catfish have voracious appetites for most types of algae, including blue-green algae, red algae, black algae, and even brown slime algae. As scavengers, these fish also feed on leftover fish food and plant waste, helping to cut down on the amount of waste that is produced in the first place. If possible, you should supplement your twig catfish’s diet with spirulina algae tablets about two or three times a week. They appreciate plenty of spaces to hide and are, in fact, camouflaged by nature. Providing lots of structure, such as bogwood and plants, is a good idea. Twig catfish are active breeders, meaning you will need to be careful about pairing them with other catfish. Because they reproduce quickly, you could have a massive population of catfish in your tank if you are not careful! This curious breed of snail also loves to eat algae. Also known as simply trumpet snails, this species primarily eats algae and can really help cut down on the amount of waste in your tank. Earning their name for their trumpet-shaped shells, these snails are dark brown in color (although there are some rare black trumpet snails as well). These snails aren’t particularly active during the day, preferring to hide underneath the gravel, and you may wonder at times whether they will be able to keep up with their algae-eating duties. However, given the chances, the Malaysian Trumpet Snail can completely clear your tank of algae. They prefer to live in tanks that contain live plants and will do most of their feeding and exploration at night. At night, you can find them digging through the substrate to diligently clean up any algae and debris. Malaysian Trumpet Snails will eat all types of algae, as well as excess food or vegetation that might be floating around your tank. They do not eat live plants, preferring instead to roam around them, so you can keep your tank fully occupied with decorations. They do, however, need a tank with a higher alkaline balance. This helps to keep their shells firm. They should not be kept with predatory fish, as they will quickly become their prey. Ramshorn snails thrive in tanks with lots of plants. They appreciate the multiple places to hide, and unlike many types of algae eating snails, they won’t eat your live plants. They prefer instead to leave algae and dead plant matter and will only resort to eating living plants if they are on the brink of starvation. They can also eat leftover food and fish eggs. These snails are aptly named because their shells look somewhat like the horn of a ram. They are usually red or brown in color, growing to only an inch or so in length. Preferring alkaline waters, they cannot live in acidic waters, as it will dissolve their shells. They like warmer waters and can clean just about any type or size of tank. If you decide to keep ramshorn snails, know that they can help clean your plants, aquarium walls, decorations, and bottom of your tank. They are good when kept in combination with other algae-eating fish, snails, or shrimp, but keep in mind that they should not be kept with predatory fish. 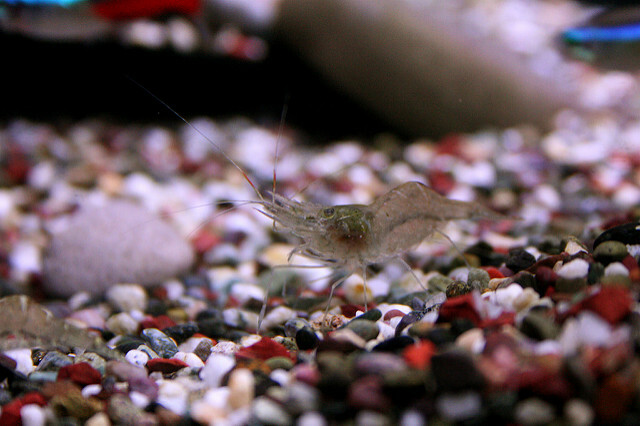 Ghost shrimp are popular algae-eaters because they are affordable to purchase. 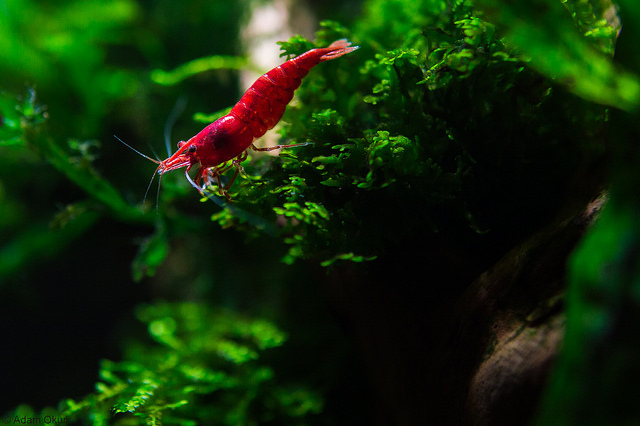 One of the least expensive options, Ghost shrimp don’t eat as hungrily as Cherry or Amano shrimp, but they can still put quite the dent in the algae of your aquarium. These shrimp are often sold as food for other fish, which is why they are so inexpensive. Ghost shrimp are small and translucent and are good at getting rid of hair algae in particular. 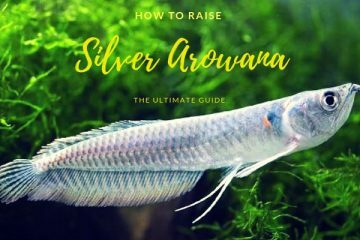 Unfortunately, they are often eaten by other fish, so you need to pay attention to the feeding habits and preferences of the fish you already have before purchasing even a single Ghost shrimp. That being said, Ghost shrimp can be fun to look at and to watch as they work, and are a good choice for a tank filled with fish that don’t eat live foods. Siamese algae eaters are some of the most prolific algae eaters out there. Often confused with Chinese algae eaters, they are distinct species, with Siamese algae eaters never growing quite as large as their close relatives. These fish are suitable for small tanks and can eat all types of algae, from blue to red to brown. Siamese algae eaters are most efficient at algae-eating when they are young, relying very little on supplemental food sources like pellets. Molly fish are common freshwater aquarium species for their appearance alone, available in a range of striking colors. However, these fun fish are also able to perform double-duty in that they are voracious algae eaters. They are independent and solitary by nature, requiring minimal care and upkeep. 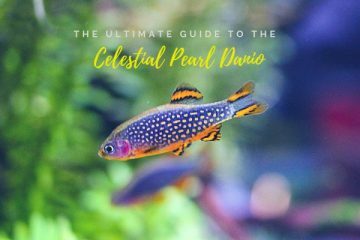 As a result, they are commonly recommended as a first-choice fish for newbie aquarium hobbyists. For best results, supplement your molly’s diet of algae with a bit of flakes. This will help keep your molly feeling vibrant and strong. They eat large amounts of algae and can be great algae-eaters when left to their own devices in a tank, or when paired with other algae-eating creatures. You can also feed your mollies protein-rich food sources like bloodworms. Because mollies are a hybridized species of fish, you can find mollies in just about every color, from golden to black to dalmation varieties. The best mollies for algae-eating purposes are black mollies, which are the most efficient at cleaning up loose particles in the tank. Most mollies are easygoing in nature, but some can be aggressive if overcrowded. 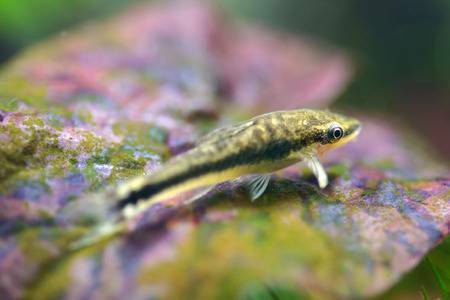 Also known as dwarf suckers, Otocinclus catfish are classic choices for small fish tanks that are less than ten gallons in size. 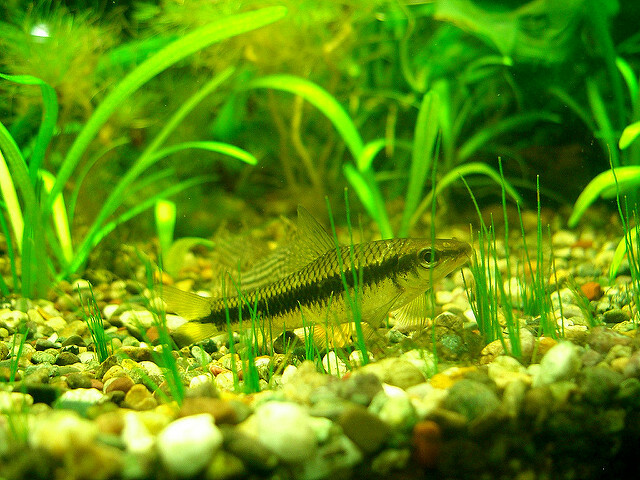 These small fish can eat algae even when it’s crowded in a tight spot, such as on decorations or between plants. These fish are not aggressive and get along well with just about any other species of fish (with the exception of angelfish, who are known to attack Otocinclus catfish without warning or apparent reason). They are happy as long as they have plenty of algae to eat, enjoying brown algae in particular. That being said, they will eat any kind of algae you have to spare. The Mystery Apple Snail prefers to dwell on the bottom substrate of your tank and grow to nearly six inches in diameter. Sold in a variety of colors, from brown to yellow and more, this snail is famous for its myriad hues and multiple color patterns available. This snail is best suited for tanks of around 20 to 30 gallons (or even more if it is given other tankmates to help clean up the excess algae). It will eat any type of algae, but it prefers plant and substrate algae. It will also feed on bottom substrate vegetation, so you need to be careful when choosing the plants you decide to include in your aquarium, as they can easily become snail food! The Mystery Apple Snail reproduces very slowly, with males and females partnering in a 1:1 ratio. Therefore, they are a good option if you want a tank population that won’t accidentally explode on you! Mystery Apple Snails are typically sold as babies, but it’s important to reember that they can grow to nearly the size of a tennis ball, requiring significantly more tank space as adults than they did as babies. These snails make a great addition to your tank, offering entertainment as well as functionality. They are easy to spot as they brush their large antennas across the aquarium floor, and they will eat any kind of leftover food. They have a large appetite, and while they will eat any kind of algae you have to offer, it’s also recommended that you supplement their diet with some other foods, like vegetation. 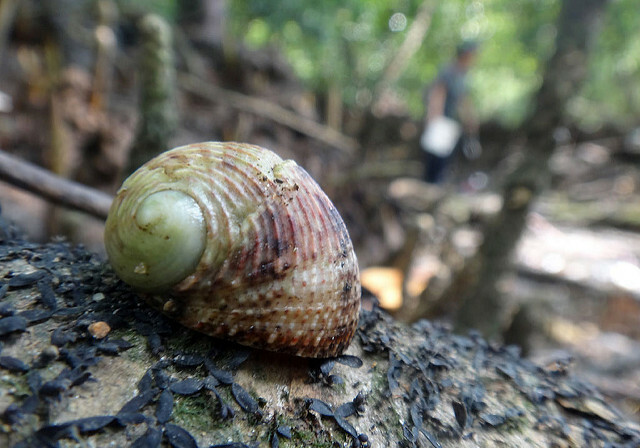 Mystery Apple Snails are solitary by nature, but smaller varieties may become targets for predatory fish. If you have any of these kinds of fish in your aquarium, exercise caution before introducing Mystery Apple Snails. Nerite snails can be one of the more challenging varieties of snails to care for, only acclimating well to certain types and sizes of tanks. Loach fish and cichlids cannot be kept with nerite snails, for example, as the snails easily and quickly become prey to the fish. These snails are also quite adventurous and will climb out of your tank if given the chance, so a covered tank is also a necessity. 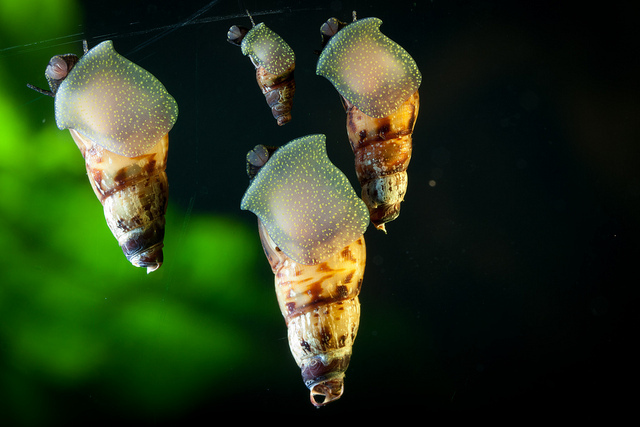 These snails lay their eggs all over your tank, and while that’s not problematic in itself, it can make your tank look a bit messy, somewhat contradicting the ultimate purpose of these snails (which is to make your tank look cleaner, not dirtier). 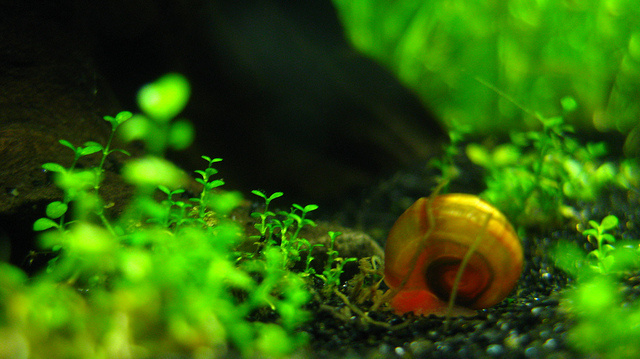 That being said, nerite snails are a good choice for cleaning up excess algae, as they will eat any type or form. Nerite snails will even eat Green Spot and Green Beard Algae, purportedly two of the hardest algaes to clean. They are also bottom feeders, helping to keep the substrate clean as they feed. Nerite snails are one of the most popular varieties of algae-eating snails, mostly because they have such a voracious appetite for algae and are attractive to look at. They have beautiful, zebra-striped shells and can be found in multiple colors. Besides the difficulties presented by their curious personalities and breeding habits, Nerite snails are a good option for more alkaline tanks. They need a pH of 7 or higher to help keep their shells hard, preferring slightly hard water as the calcium in it will help keep their shells strong. Another zebra-patterned algae-eater is the Indian Zebra Shrimp. While this creature also has stripes akin to those of a zebra, it is a shrimp instead of a snail. This type of shrimp can grow up to 1.4 inches in length, and has distinctive nasal antenna that help it sense and find its food. These shrimp can live with passive tropical fish, along with other shrimp and snails, but should not be kept with predatory fish who will view the shrimp as food. Ideally, your Indian Zebra Shrimp should be kept in a tank of at least 20 to 30 gallons in volume, with a temperature that is moderately warm. Indian Zebras can eat any type of algae found in freshwater tanks, including soft green and golden brown algae. These types of algae are usually found naturally in Indian rivers and lakes, which is why these shrimp are so attuned to it. Indian Zebra shrimp breed rapidly, so if you are keeping more than one, you will need to be careful unless you want a breeding population on your hands. Another popular algae-eating catfish is the Bristlenose Plecos. This fish can grow up to six inches in length, and is colorful, with feather-like fins and tail. The Bristlenose can live with any other non-confrontational, peaceful fish, preferring tanks that are at least forty gallons or larger. It will eat any kind of algae, preferring green spot algae in particular, although it will also consume DIatoms, red algae, and brown algae without complaint. Bristlenose Plecos can consume a ton of algae as they cruise along the bottom of your tank, but they should also be fed sinking algae pellets to complement their diets. They are unique in that they are one of the few algae eaters to consume Green Spot algae, which is usually ignored by other algae eaters. These fish are more active at night and are generally passive, making them a good choice for large tanks, even those with particularly aggressive fish. These bright-red shrimp are easy to care for, adapting easily to most settings and possessing the unique ability to shed their exoskeletons now and then. 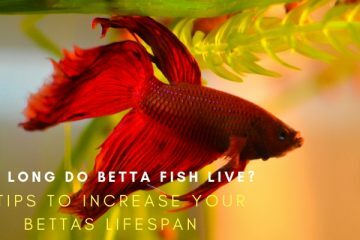 While this means you will need to clean the tank of their shells from time to time, the benefit they offer as an algae-eater far outweighs this minor hassle. Growing to two inches in length, Cherry Shrimp are effective algae eaters and are a good choice for tanks smaller than ten gallons. Although they usually come in a vibrant red color, they can also be purchased in other shades. 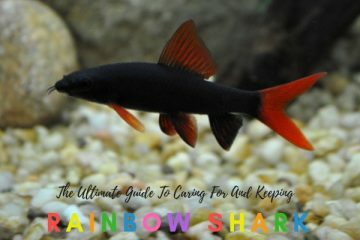 They are calm and versatile, able to get along well with smaller fish. They prefer algae and biofilm as regular parts of their diet, but can also be supplied with plants, zucchini pieces, flakes, and other vegetable products. Cherry Shrimp can be kept with any non-predatory fish and snail species, along with other shrimp. They form large colonies in a short amount of time, and will clean up algae growing on the wood, rocks, and even the substrate of your tank. 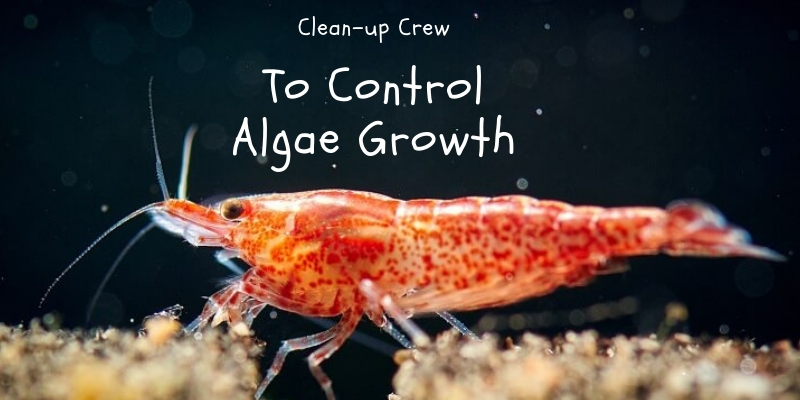 Because they are so small, they are great at cleaning up algae in hard-to-reach places. They will also tidy up leftover fish foods, pellets, and flakes. Rabbit Snails are shy, yet large, growing to almost five inches in diameter. Their bodies are made of two colors, usually a dark brown shell and a yellow head. The snail normally keeps its head tucked away inside the shell, surfacing only when it wants to move. These snails can live in peace with a variety of other aquarium dwellers, including popular algae-eaters like the Otocinclus Catfish and the Amano Shrimp. It prefers large tanks of 25 gallons or more in size, but can exist peacefully in smaller tanks as well. This algae-eater will eat any type of freshwater algae, preferring soft and green algae in particular. It will also eat leftover bits of fish foods and Java Ferns. Rabbit Snails don’t breed often, only once a year or so, so you can keep multiple snails at once without a problem. 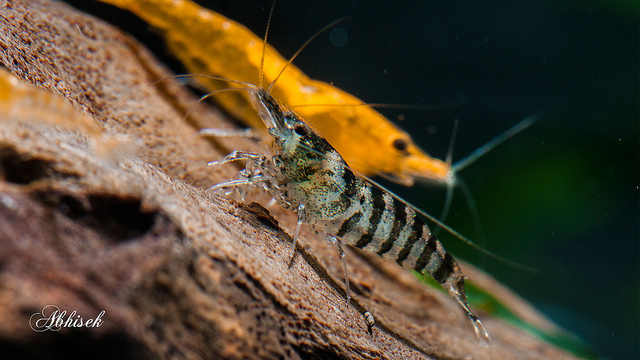 Amano Shrimp can grow up to 1.5 inches in length when kept in the proper freshwater conditions. Native to Japan, this shrimp likes to climb up the plants and rocks in your tank, meaning you should always keep the tank covered so it doesn’t accidentally escape. 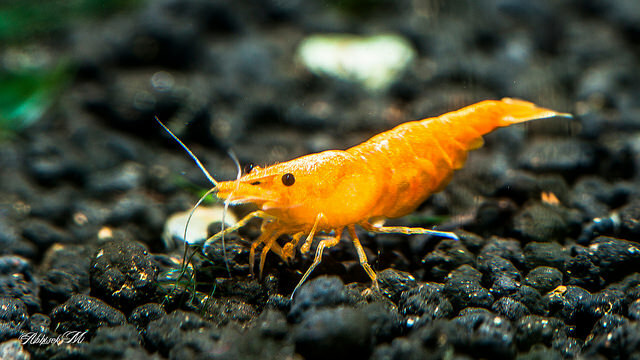 These shrimp can be kept with any other fish, but ideally ones that are more passive. 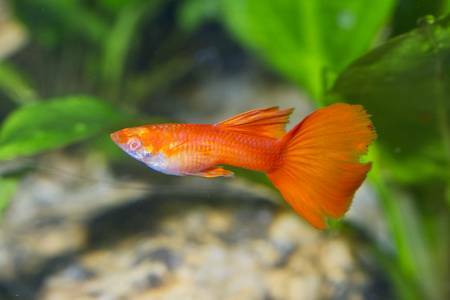 Predatory fish are definitely off-limits, but you can include guppies or other algae eaters. 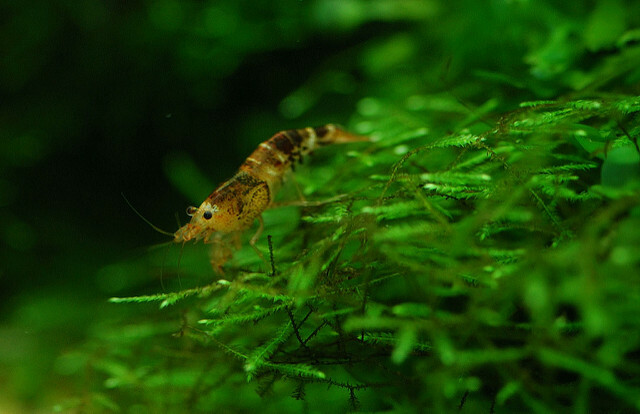 Amano shrimp eat all kinds of tank algae, including red, brown, blue green, and green. In particular, it loves hair algae. It will eat voraciously, so you should supplement the diet of this shrimp with algae pellets. 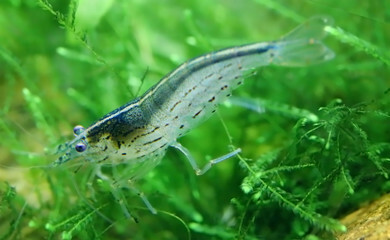 Avoid using any kind of chemicals for the plants in the tank, as the Amano shrimp will eat those, too. Right from the very moment you purchase your tiny juvenile tiger shrimp, you will be amazed at how quickly it begins to clean your tank. Tiger shrimp are born algae eaters, growing to a large size up to thirteen inches. It can live in peace with any tropical fish, shrimp, and snails, so long as it is not a natural source of prey for one of these creatures. These shrimp require tanks of at least fifty to sixty gallons (or more, in many cases), as they grow to such extreme sizes. They will eat any species of algae, and should be supplemented with algae pellets and vegetation. One of the more colorful algae-eaters, the American Flag Fish is an adaptable species that will eat algae for hours. Traditionally keeping to itself, this fish is native to the swamps of Florida and is patterned in a manner that is reminiscent of the American flag. These fish are solitary creatures, often hiding between rocks and plants. Growing up to two inches in size, this fish likes to school, so you should keep it within a community of fish. Other fish it can coexist with include gouramis, cherry barbs, and Endlers. Ideally, it should be kept in a tank of around thirty gallons or more. While the fish won’t disturb species of fish on higher layers of the aquarium, it will remain most often in the center and bottom layers of the aquarium, eating just about any type of algae. 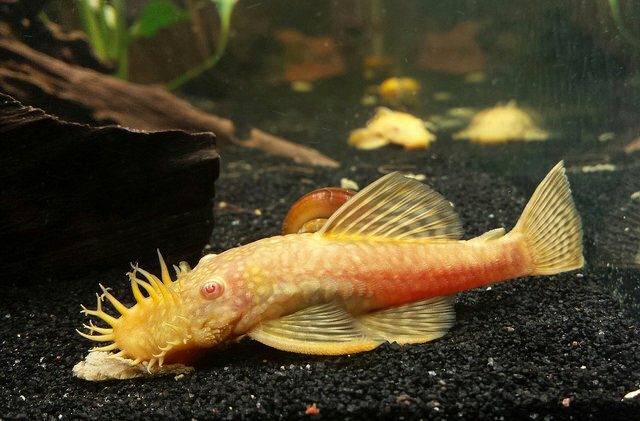 The Golden Nugget Plecos is a schooling catfish, preferring to stay with members of its community. Growing up to a foot in length, this fish is highly sensitive to stress. It can live in peace with other fish that hang near the top layers of the tank, such as tetras and Corys. Golden Nugget Plecos prefer larger tanks of fifty-five gallons or more, ideally those with lots of natural aquascaping like rocks and caves. Golden Nuggets will eat any kind of algae, but usually gravitates toward that which is growing on the substrate level, rocks, plants, and wood. It likes to eat live foods, shrimp, and flakes as well. Guppies are some of the most popular fish in the aquarium world, frequently purchased for their calm temperaments and attractive appearances alone. However, these fish are also voracious algae eaters, which many aquarium owners discover as a pleasant surprise once they’ve brought their fish home. The Fancy Guppy is one of the more popular varieties of guppies for this purpose, growing to an inch or two in size. Available in a wide variety of colors and skin types (including those that are translucent!) this fish coexists well with angelfish, ghost shrimp, apple snails, feeder fish, and more. It does best in large tanks of 40 to 50 gallons or more. This fish will eat most types of algae, though it prefers blue green, ed, and brown algae. Its diet should also be supplemented with flakes, pellets, and live foods to provide proper vitamins and nutrition. Native to Taiwan, the Orange Shrimp is an attractive algae-eater that can be a bit more challenging to keep. It needs to be kept in a tank that has consistent temperature, pH, and quality in order to avoid damage. As a result, you will need to regularly clean and filter your tank. These shrimp can be kept with any other passive tankmates, like rabbit snails and fancy guppies. Anything that will not eat shrimp is fair game as a companion. These shrimp need plenty of algae feeds at regular intervals, but will eat any kind of algae you have to offer. It prefers blue green, brown, and green algae, and will also eat the biofilm that forms on underwater surfaces. You might also have to supplement with algae pellets and vitamins. Ready to take the next step? Consider raising one – or several! – of these algae-eating organisms in your aquarium. While not every tank will be designed to support each one of these creatures, adding just one type of algae-eater can drastically reduce the amount of cleaning you have to do in your tank. In a healthy aquarium, algae build up is unavoidable. Caused by lighting, sediment buildup, nutrients, and other factors, algae is a primitive form of plant life that is found in just about every tank. While some algae isn’t necessarily a problem, too much algae can cause illness and potential death among your fish populations. 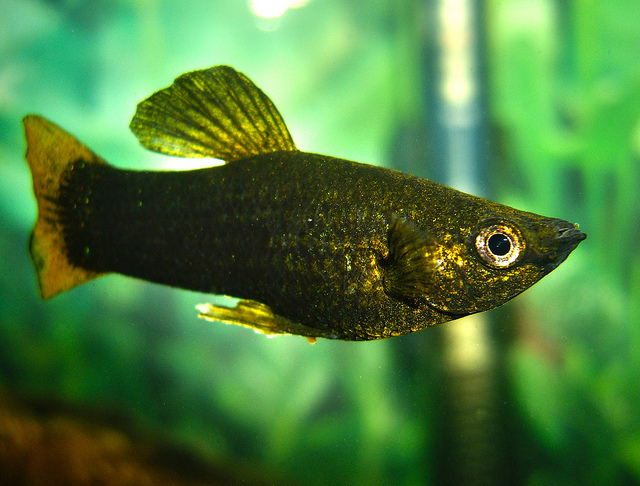 An algae eater can help get rid of your algae problem, without disrupting the delicate ecosystem within your tank. Head to your local pet store today to pick up one of these algae eaters, and you’ll be rewarded with a much cleaner – and healthier! – aquatic environment for your fish.